Hey, let’s experiment with giving the news in bullet-point form! Just three more weeks in our 2016 Farmer’s Market season. Here in Corvallis, we’re among the proud-but-shivering vendors in the November outdoor markets. Karen reports that the seasonal decline in egg production seems to have ceased, thanks to her use of lights in the henhouses, using methods summarized last time. Four of our six piggies have been converted into pork, ham, and bacon for customers, and we’ve lined up a customer to take the other two as-is. Which is just as well, since it’s been raining like the dickens (or even the Bulwer-Lytton). Pigs plus rain equals mud, at least when they’re living the kind of outdoor lifestyle our pigs do. Our pigs have just a little Port-a-Hut shelter to sleep in, not the usual spacious roofed pig shed with a concrete floor. We’re not doing Thanksgiving turkeys this year. Why not? One reason is that heritage-breed turkeys have a distressing tendency to escape and vanish en masse into the woods, never to return. We were hatching our own turkey eggs until the breeding flock skedaddled. And just to rub it in, about twenty wild turkeys are hanging around the farm, bold as brass. I suspect that modern broad-breasted turkeys are more likely to stay put, partly because they’re less agile, partly because they dislike going far from the feed trough, and partly because they grow at least twice as fast, leaving that much less time for them to get any funny ideas. This would involve buying day-old poults during the summer, since spring-hatched poults would be the size of hippos. A neighbor down the road has a nice flock of white broad-breasted turkeys that are still where they’re supposed to be. We won’t be doing many new projects until the new year. My current feeling about brooding pullet chicks in the winter is that it’s a great idea once you get the moves down, but, for our personal convenience, not during the holidays. January is soon enough. My science fiction novel, One Survivor, contains a number of things that might seem extraneous in a book that starts with a space battle. This includes three fairy tales, a prophetic flight simulator run, and much else. 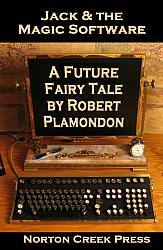 I’ve broken out one of the fairy tales as a stand-alone Kindle e-book: Jack & the Magic Software: A Future Fairy Tale. It’s yours for a measly ninety-nine cents. Win a Free Copy of Feeding Poultry! If you hang around with poultry enthusiasts, you hear a lot about how to feed chickens. People talk endlessly about feeding: what to feed, how to feed it, and which changes in feeding to make in response to any imaginable problem. But you can stand out by having something few of them have: an actual book on poultry nutrition! 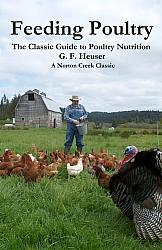 Feeding Poultry by G. F. Heuser is the kind of book I spend days in libraries looking for: detailed, readable, based on careful observation and research, and full of information that most people have never heard of. Information you can often use right away. For example, it has a whole chapter on range and green feeds. Not only that, it was written when free range was still widely practiced, but before it was politicized or turned into a market niche. So the material is presented on the basis of real, often long-term experience, and without any kind of spin. It also talks about some pretty wacky feed ingredients (wacky, that is, unless you can get them cheap because they’re a byproduct of a local industry). If you happen to have access to starfish meal, should you feed it? How about silkworm chrysalis flour? Coconut oil meal? Distillery yeast? Sauerkraut? You name it: it’s listed here. Of course, it talks about the more normal ingredients, too: every kind of grain, bean, protein supplement, mineral supplement. It tells you the difference between #1 corn and #2 corn, and the difference between fresh soybeans, roasted soybeans, and the many different kinds of soybean oil meal. It also covers the nutritional chemistry: Which amino acids, vitamins, and minerals are likely to be missing in different kinds of diets, and what to add to bring it up to where it should be. And of course it tells you the different requirements of poultry of different ages and species, because this isn’t just about chickens: it covers all species of poultry (though there’s more about chickens than the other species). And the book tells you many, many practical details. (It should: it’s 640 pages long!) Including about a zillion feed recipes that have been tested under controlled conditions, using different ingredients according to what tends to be cheaper in a given region. For example, here in the Far West, feed wheat can be cheaper than corn, and there are recipes that take full advantage of this. I’m not claiming that you’ll sit down and read this book cover to cover, but you’ll read more of it than you think. And if Feeding Poultry doesn’t float your boat, I have plenty of other books just waiting to go under the Christmas tree. Just rummage around in my Norton Creek Press web site. You’re sure to find something. Open-Front Houses. One of the more eye-opening books I’ve read is Fresh-Air Poultry Houses by Prince T. Woods, M.D. Dr. Woods described how one of his healthiest chicken flocks spent the New England winter, not in a hen house, but in the branches of a nearby grove of pine trees. The exposure to the weather kept them from laying much, but they were astonishingly healthy and active! This was around 90 years ago, when a lot of people were knocking out the south walls of their chicken houses to allow more light and ventilation, winter and summer alike. It worked then, and it works now. It’s an amazing thing to witness. So counter-intuitive! But it works. So my advice is not to fret over cold or drafts for your grown chickens—that’s for day-old chicks. Resist the temptation to remove the last vestige of airflow and light from your chicken houses. Instead, do what you can to keep the water and feed flowing in freezing weather, and generally provide an environment where the chickens can stay active. Ventilation, daylight, some kind of freeze-proofing in the waterers, and the ability for the hens to stay busy are the keys. Winter feed and water. Because our hens are in little houses scattered over acres of pasture, snow makes it wearisome for us to carry feed and water to them. We use big range feeders that minimize the frequency with which we have to fill them. Because over 90% of winter days here have highs above freezing, our water is (usually) flowing through our humble network of many hundreds of feet of garden hose. This means that, on most days, even if there’s snow on the ground, the heaviest things we have to lug around are baskets of eggs. If it’s colder and the hoses stay frozen, we have to carry water, too. I object to carrying water in buckets. Not carrying water in buckets is what technology is all about. But we do it a few days per year. First experience with snow. Chickens are startled by the first snowfall if it’s heavy enough to completely cover the ground, so if you put all in outdoor range feeders like I do, their reluctance to go outside will cause them to miss some meals. This in turn will cause a slump in egg production. If we scatter a little straw on top of the snow, making a path between the houses and the feeders, the chickens will venture out willingly. They don’t mind walking on straw. They quickly get used to snow after they’ve seen it once or twice, and the straw becomes unnecessary. Scratch feed as exercise. In the old days, farmers liked to use straw on the floor of the chicken house and scatter some grain in it every day. The chickens would spend hours and hours hunting for the last morsel. Their scratching around in the litter would fluff it up and keep it from caking. This gives them exercise in cold weather, which presumably keeps them warm, and gives them something to do. Temperature and egg production. The rule of thumb is that the rate of lay falls whenever the chickens are exposed to daytime highs (indoors) below freezing. Their health starts to suffer around twenty degrees below zero when they’re kept dry. Frostbitten combs are more a sign of excessive dampness than excessive cold. Some chickens can’t seem to drink from a bucket or pan without getting their combs wet, so using waterers that don’t present that much surface area may be a good idea. Insulation. The folk wisdom used to be that heating a chicken house never paid for itself. Also, it didn’t let the chickens get hardened to the cold, so any interruption in the heat was bad news. In the old days, insulation was considered a bit extravagant, even in cold parts of the U.S. and Canada. Insulation pays in big chicken houses, but the chicken houses were pretty small in the old days, rarely bigger than 400 square feet. The main advantage of insulation in a chicken house is to keep the chicken house dry. Specifically, it prevents condensation from forming on the ceiling (and, to a lesser extent, the walls) and dripping into the house. With an insulated roof, you don’t need as much ventilation, but it still takes quite a bit of airflow to maintain a reasonable level of dryness in the house, since the chickens introduce plenty of moisture through their breath and droppings. Food is warmth. Most of all, don’t let chickens run out of feed or water in cold weather. They can stand a lot of cold if they have plenty of food energy, and to eat, they must also drink. November is usually a fine month for grown chickens, and can even be a good month to start baby chicks if you’re set up for it. We tend to avoid receiving baby chicks in December and January, due to the increased chance of long power outages here, but we brood the rest of the year. November is a good month to prepare for winter, and it’s not too early to prepare for baby chicks, either! Clean outdoor equipment and store it indoors until needed. Order any necessary brooder parts. You’re likely to start brooding again in January, and that’s right around the corner! Use artificial lights on hens. Remove litter that becomes wet or disgusting, or pile it in a heap in a corner until it composts into nice clean litter again (this only takes a few days). Add more litter as required. Don’t be stingy with litter. Don’t let the house get too dark. Chickens don’t like eating or drinking in the dark. Don’t block off your windows. Flag pasture obstacles and equipment with something tall if there’s a chance that you won’t mow in the spring until the grass is as high as an elephant’s eye. You won’t remember if you put it off. Bleach bottles stuck on the tops of T-posts are traditional.